I make money each month from seven online sources. The only true financial independence is having multiple sources of income otherwise you’re always going to be chained to that one income source. But managing all this, you need some to be passive. What’s the point of making money if you can’t enjoy it because so busy…making money? Blogging isn’t passive, you have to keep cranking out that content. Freelancing is good money but the farthest from passive. There is one online income source though that is almost completely passive income. I made over $20,000 from this source last year alone and did next to nothing. 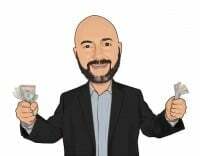 I’m going to share with you my favorite passive income source, how to set it up and five tricks to make thousands a month so don’t go anywhere. Haven’t joined the Work from Home YouTube Community yet? Don’t miss a single video on beating debt, making more money and making your money work for you! Check out the channel and subscribe. 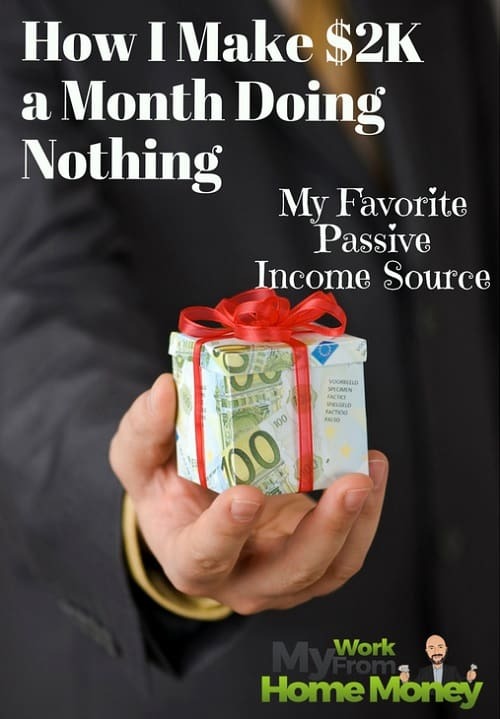 What is True Passive Income? Passive income is awesome, OK. That’s when you make money off a product or something you developed in the past but continue to make money off it after you’ve stopped doing the work. So think of royalties musicians get for their songs or actors get if they’re participating in box office sales for their movies. I make money on seven income sources consistently and a few others less regularly. The regular sources are sponsored posts, courses, affiliate marketing, blog advertising, self-publishing, real estate, and dividends. All but the last two are related to my blogs and online business. Passive income is a source you make money on without having to do any work. Now there’s a whole range of this from absolutely no work to maybe just a few hours a month. The best passive income sources are the ones you can set up and forget about. But most of these income sources are far from passive. I’ve already talked about why real estate isn’t passive income, how I almost went broke burning out managing my own rental properties. Blogging isn’t really passive either because you’re always trying to create that new content to bring people to your website. One of these online income sources is almost completely passive though. I make nearly two grand a month on it, money I can count on to be in my checking account to pay the bills even if I don’t do anything. The best part is, it’s an easy income source you can combine with one of the others. We’re talking self-publishing here. 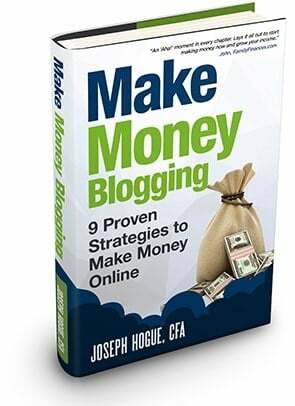 Now before you click out, thinking you can’t write a book, anyone can do this and it will make you money every single month. I’ll walk you through five tips in my self-publishing passive income strategy below, from developing your idea to launching the book. I’ll also share how I set up my book to be almost completely passive after the launch. Seriously, I’ve published 10 books. I do about $200 in marketing each month and nothing else. From that, I make almost $2,000 a month. That money from Amazon hits my checking account every month on the 29th without fail so no matter what, I always know I’m going to start the next month with cash in my bank account. That’s a pretty good feeling. So let’s get to these five tips on turning self-publishing into passive income. First, use a blog to help keep you on track and as a marketing channel. When you’re planning your book, brainstorm eight to twelve chapters and outline each. Plan on writing a chapter a week and posting it to your blog. This is going to break our book into manageable chunks and keep you on track. It also turns your blog into a natural marketing channel. Once your book is published, you go back through each post, add a call out for your book and the link to the Amazon page. 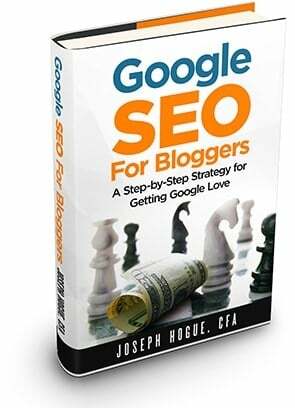 By that time, the articles are all getting Google search traffic from people interested in your book’s topic and likely to click through to buy. 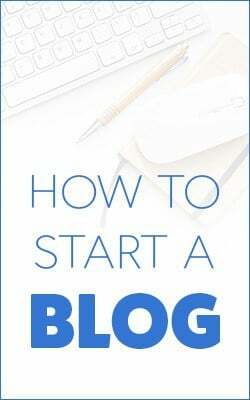 I get a few dozen sales from the blogs each month, along with a small marketing budget, that’s enough to keep them ranked on Amazon to sell hundreds of copies. The second tip here is to use Amazon Marketing Services. This is how you advertise your book directly on Amazon where people are most likely to buy it. For just about $20 per book each month, I get hundreds of visitors to a book page and dozens of sales. Amazon shows you exactly how much you’re paying for your ads, what is working and the return on each so it’s really an easy system. One of the most important things you can do to make self-publishing a passive income source is with a strong book launch strategy. This is where you juice the book’s ranking and social proof over those first couple of weeks so Amazon takes over and does the rest. Months before you launch, you’re going to want to reach out to family and friends for a review. Don’t just post on social media that you need help. Personally email or message everyone individually. You’ll get a lot better response and people will actually follow through with their commitment. Plan on lining up at least 15 to 20 reviews. Let people know that these don’t have to be long, detailed reviews. You just need them to go to the Amazon page in those first couple of days, buy the book for $0.99 and then leave a couple sentences for a review. That launching for $0.99 is important because it gets you immediately on the paid ranking scale. Don’t launch your book for free because it will lose it’s ranking when you switch to paid. At $0.99 it’s not about the money so you’ll still get people that will support you, buy the book and leave a review. This next tip is an easy one. If you’ve got a website, you’ve probably already got some way you are sharing on social media. Most bloggers use a social media management tool to automatically post to Twitter or Facebook or another platform. Add ten social shares about your book. These are different shares to promote your book continuously on social media. So it can be things like interesting quotes or facts. It can be contributions from other people, of course be sure to tag them in the share. Basically, you want ten different tweets or social updates you can use to share on social. You’ll continuously share these out, maybe two a month, to get a few extra sales. Finally, the last tip here to turn self-publishing into a passive income source is to write more than one book. I know a lot of authors publish one book and then get discouraged when they only make a hundred dollars a month. Some books just don’t do that well. 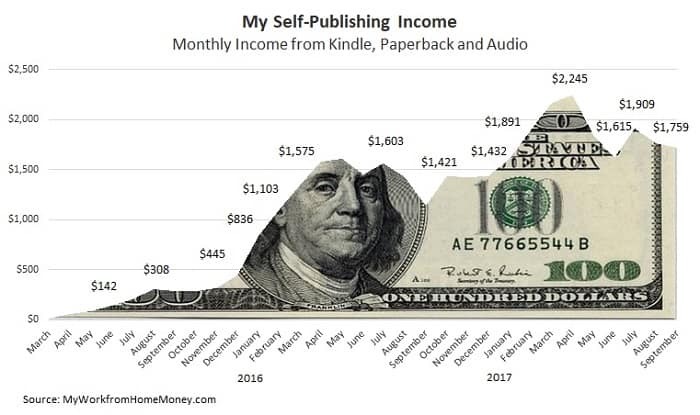 Of my ten books, I’ve got a couple that only do a hundred a month on average but there are others that average several hundred and one consistently hits five hundred a month. Create two or three books a year and the numbers will work out for you and you will be successful. Averaging around two hundred dollars a month on each book adds up when you’ve got five books published. That’s an extra grand a month you’ve got coming in. I’m not going to say self-publishing is completely easy because it’s not. It’s one of the best passive income sources you’ll find but it’s still a lot of work. You still have to develop, write and launch your book. But if it were easy, everyone would do it and no one would make any money. Master this process and you can create a new book every few months for a passive income stream you can count on.